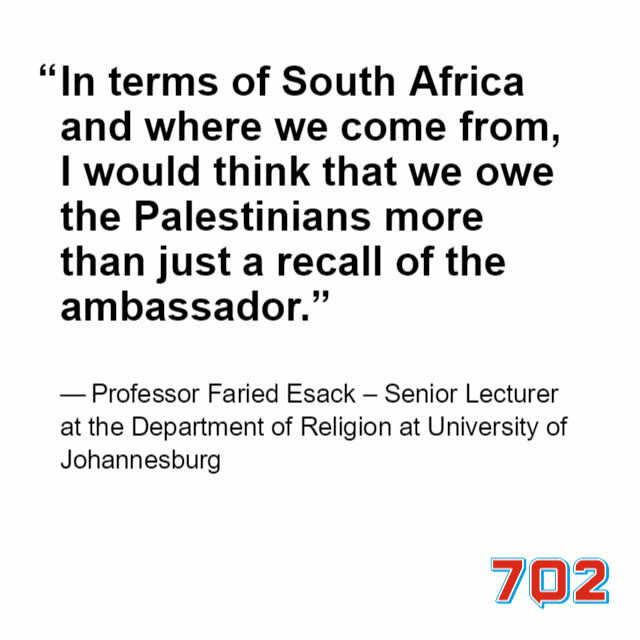 Senior Lecturer at the Department of Religion at University of Johannesburg Professor Faried Esack says a decision by South Africa to withdraw its Ambassador to Israel is a good move. The decision follows the killing of Palestinian protestors at the Gaza border during a peaceful demonstration against the provocative inauguration of the US embassy in Jerusalem. In a statement government condemned the latest act of violence carried out by Israeli armed forces, which it says has led to the deaths of over 40 people. Speaking on the African National Congress' Nasrec resolution to downgrade the South African embassy in Isreal, Esack explains the geopolitical realities faced by the party. The reality is we are dealing with a Unites States administation that takes other independent countries as it's vessels and it acts with impunity and so these are the geopolitical realities that we have to take cognisance of. The one is loyalty to ANC resolutions, loyalty to what our country stands for and the direction in which the vast majority of our people wants our government to move into and on the other hand being in government has its own complexities but this is indeed a step in the right direction. In a statement, the SA government says it condemns in the strongest terms possible the latest act of violent aggression carried out by Israeli armed forces. In SA, Pro-Palestine demonstrators marched to Parliament to denounce Trump's decision to recognise Jerusalem as Israel’s capital. On Thursday the EFF marched to the Israeli embassy in Pretoria to display their solidarity with the Palestinians. Pro-Palestine activists won’t agree, but Woolies is the most reputable company in SA, according to the Reputation Institute.